Control your lighting, television, heating and much more with your iOS device. Most iOS users will already be used to using their iPhone or iPad in just about any situation - to kill a bit of time with some games; to check the train schedule; to write a shopping list; to watch a video - you can do a huge amount with these tiny computers. But what you can do with the device isn't just limited to things contained within its screen - you can control your home from it as well. Instead of getting up to hit the light switch, you can just grab your iPhone. To see what's on and change the channel, grab your iPad. Everything from the temperature to the curtains can be controlled with the right apps and accessories. It's not just about giving commands, though. With wireless audio and video, and remote access to the files on your PC, you can use your iOS device to conduct your digital life like an orchestra. You can even monitor the security of your home when away (or just keep an eye on the baby). If you think you use an iPhone for everything now, just wait until you're changing the colour of your mood lighting with it. Soon, you'll never have to leave your sofa again (with the exception of basic human needs). While the comprehensive home installation is still an option (and is still expensive) for giving you the most complete control, there are also now easier accessories that can give you many of the same options, but just need to be plugged in. 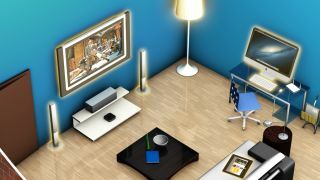 The crucial thing these days is that they're just about all app-connected - with the right download from the App Store, you can take total control of your house from your iPhone or iPad. When it comes to lighting, one of the more outlandish options is the Philips Hue set. These LED lightbulbs just plug into regular light sockets, but are wirelessly controlled by a base station that connects to your iPhone or iPad, so you can make lighting changes from the accompanying app. What makes the Hue different to other light-dimming systems is that you can change not just the brightness of the bulb, but also its colour. The app lets you customise colours, and if you have multiple Hue bulbs, they can be different colours - you can even tell them to match the various colours in a photograph, to set a scene. Perhaps unsurprisingly, the Hue bulbs are quite expensive, so if you want a similar system for less, have a look at LightwaveRF's dimmable CFL bulbs. Like the Hue, they work in normal lighting fixtures and you control them from an iOS app. They don't change colour, but you can control their brightness (or turn them off) without having to install custom light switches. If you don't want to buy expensive smart lightbulbs, installing custom light switches can be a great option. You basically replace your current light switch with one that can communicate wirelessly to a compatible base station, and you'll gain dimmable and remote control of any light that switch connects to. LightwaveRF sells switches that work with its base station, as do many other companies, including Control4 and the X10 range (uk-automation.co.uk). If you use a lot of lamps in the home, you can use plug-based systems to control them. LightwaveRF makes plug sockets that can be controlled by your iOS device. Alternatively, the same company makes plug adapters for wireless control - plug your lamp into the adapter, which then plugs into the wall socket. Belkin's WeMo range also offers this kind of adapter. They're more expensive than LightwaveRF for each unit, but don't require a base station to function (they connect directly to your iPhone), so might cost less up front. In either case, you can then control multiple lamps either independently, or together. With most of these controller apps, it's then possible to group sets of lights together, so you can set 'scenes' or 'moods'; a 'movie' mood might have your main light off and some side lamps on dimly, for example. The Control4 system includes a Goodnight option, which will turn off all lights in the house in one tap. Of course, these iOS-controlled plugs and plug adapters can be used for more than just lights. You could control a fan remotely, or turn off your computer or TV at the wall to save power. There's also a safety aspect - LightwaveRF touts the ability to immediately disable all the power sockets in a room if you're worried about a child playing with them, for example. Controlling the heating is something else that's really useful to be able to do from your device - especially if you want to turn the heating on before you get home. The Nest thermostat is a smart system that learns about how your home is heated and when you tend to feel cold, and adapts automatically, but it can also be controlled remotely from your iPhone (if you have more than one, you can control them independently too). Control4 also offers a wireless thermostat system, where multiple thermostats can be controlled independently if you have zoned heating. If you want that kind of granular control without installing separated heating systems, though, there is a simpler option. LightwaveRF offers wirelessly controlled radiator valves that just replace the normal valves on your radiators. Each can be controlled individually, letting you create 'zoned' heating without having to have a full installation with multiple thermostats. You can then control the valves with your iPhone as well as the compatible wall-mounted control. You can even use your iPhone to keep your house secure. This is at its most direct with Control4's lock system - its smart deadbolt and handles can be installed instead of a regular lock, and can be controlled either by using a good old-fashioned key, by entering a code on the buttons above the lock, or by using your iPhone. Just before bed you could make sure all the locks on your doors are set just by grabbing your iPhone and hitting the button in the app. Z-Wave also offers this type of lock. Most of these systems will also let you set timers for many things, such as the lights, so you can set them to come on and turn off at certain times, perhaps to give the impression that you're in. This doesn't require any further hardware than what we've already described – you can just set this in the app. Some systems, such as Z-Wave, even let you open and close the curtains from your iPhone – and that can also be scheduled, so it appears that someone is in your home when you're on holiday. Read on to discover how to control your home entertainment with your iOS device.